There was a single Mighty Yankee who held the Gulf Coast Heavyweight title in 1959. That was the great Ray Villmer.. There was a masked Mighty Yankee team in Texas in the early 1960s made up of Moose Evans & Bob “Giant Evans” Stanlee.. There was a masked Mighty Yankee team in Tennessee for Nick Gulas in 1968. 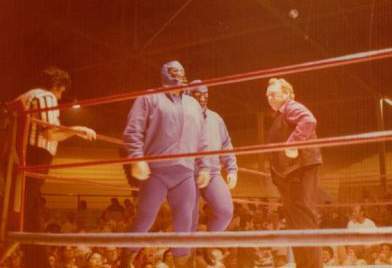 That was Frank Morrell & Eddie Sullivan..
~~~There was a masked Mighty Yankee #3, who was later unmasked–turned out to be east Tennessee heel legend Ron Wright! There was another masked Mighty Yankee team in Tennessee in 1969. That was Tony Russo & Pepe Lopez..
~~~~~~~~~~~~~~~~~~~~~~~~~~~~~~~~~~~~~~~~This team was unmasked by Saul Weingeroff’s Spoilers.. There was another Mighty Yankee team in 1974-75. That was Gary Fulton & Frank Morrell, managed by George “Two Ton” Harris.. There was another Mighty Yankee tag team in Florida in the 1980s. That was Bob Cook & Jerry Grey..